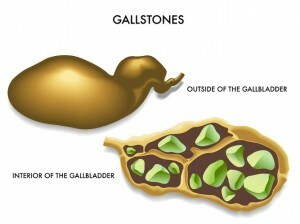 Gallstones are hard deposits that are formed inside the gallbladder. They can range from the size of a grain to larger than a golf ball! 80% of gallstones are made from hardened cholesterol, developing from too much cholesterol in the gallbladder. They can also caused due to the presence of high levels of bilirubin and a concentration of bile in the gallbladder, or Pigment stones, small dark stones made of bilirubin occurring in people who have cirrhosis, BTI, hereditary blood disorders, etc. Pregnancy, diabetes, unhealthy and imbalanced diet, sedentary lifestyle, liver diseases, intake of high fat diet, lack of exercise, stress, hormonal fluctuations, being overweight, certain types of anemia, etc. are some of the causes for gallbladder stones. They generally occur in people older than 60 years, females who take oral contraceptives, overweight and those who are Native American or Hispanic descent. Gallstones can go noticed for a long time, however, when they get struck in the bile duct it can be recognized by symptoms like back pain, sudden onset of severe pain particularly in the right side of the abdomen, nausea, vomiting, indigestion, chills, bloating, clay colored stools, pain between the shoulder blades, yellowing of skin and eyes, etc. Consult your doctor to get proper diagnosis and then start a treatment tol cure these stones. Before going for surgery, try these natural home remedies with a small change in your diet and lifestyle can dissolve gallstones and give pain relief. An apple a day keeps the doctor away! An apple has the capability to dissolve stones and improves the functionality of the gall bladder. The malic acid in the apple helps to assist in softening the gallstones and makes it easily to remove from the bladder. Apple vinegar helps to inhibit the liver in making cholesterol. It can also help to reduce the pain caused by these stones. Mix apple juice and apple cider vinegar. Drinking daily for a few weeks to get instant relief from the pain. Make sure to continue eating fresh apples regularly. Stir fresh uncooked applesauce, shredded raw beets, lemon juice and olive oil. Consume regularly to get rid of the gallstones. Stir warm water, apple cider vinegar and lemon juice. Drink this mixture on an empty stomach in the early morning for a few weeks. Milk thistle is an herb which is widely used as traditional remedy for treating gallstones and also detoxifying the liver. It contains a bitter compound called silymarin which stimulates the production of bile and increases bile production. It helps in shrinking the gallstones and also to eliminate the pain that was caused in the bladder. Crush milk thistle leaves and seeds finely. Put in a muslin bag and place in a cup of hot water. Allow to steep for about 5 – 8 minutes. Add honey and stir well. Drink this tea regularly to get relief from the gallstones.. Grind milk thistle seeds in a coffee grinder or mortar and pestle. Place in water and put on the stove. Boil for a few minutes and then turn off the heat. Allow it to steep for about 20 – 25 minutes and strain. Add honey as per your taste. Drink this tea 2 – 3 times a day for a week or two. The recommended dosage is 420 mg of regular standard milk thistle extract per day, divided into three equal doses. Remember that if this extract contains phosphatidylcholine then the standard dosage will be 100 – 200 mg, split into 2 – 3 times a day. Make sure to consult your doctor before taking this supplement. Pears contain pectin that helps to bind the cholesterol filled gallstones and makes it easy to flush them out from the body. Add pear juice and honey to hot water. Stir well until the honey dissolves completely. Drink this three times a day to prevent gallstones. Peel and de-seed the pears and cut into small pieces. Cook in water for about 20 – 25 minutes. Strain the water and take out the pieces. Eat these warm cooked pears. Eat them twice a day on daily basis for a few weeks. Dandelion is an herb that aids in gallbladder functioning. It contains terpene, a natural compound that helps to dissolve the gallstones. Place dandelion leaves in a pot and pour over hot water. Cover and allow it to steep for 5 – 10 minutes. Strain the leaves and then add honey as per your taste. Drink this tea 2-3 times a day. Remember to consult your doctor if you’re suffering from the diabetes before taking this dandelion herb as it increases the sugar levels in the body. Add marshmallow root and oregano grape root to water on the stove. Allow it to simmer for 15 minutes and then remove it from the heat. Add dried dandelion and dried peppermint leaves. Cover and allow it to steep for about 15 – 20 minutes. Strain and drink the tea daily for a few weeks to clear stones from gallbladder. Or simply you can eat the tender dandelion leaves. Juice therapies are one of the most recommended remedies to treat gallstones. This beetroot, carrot and cucumber are a great combination among other juices in removing the gallstones effectively from the gallbladder. Beetroot helps to strengthen and cleanse the gallbladder and liver. Carrot juice is rich in vitamin C and has many other rich nutrients. Cucumber has high water content which helps to detoxify liver and gallbladder. Take equal amounts of all the three juices and combine. Drink this to prevent the gallstones and regularize its consumption once daily. Or you can take the sufficient amount of all these three vegetables and grind it to extract it juice. Individually extract the juice from beetroot, cucumber and carrot. Then blend apple, celery and ginger and grind to get a paste. Combine all the juices and add the paste. Stir it well and drink this juice twice a day on a daily basis. Note: Take this once a week to prevent its recurrence. Lemon juice, or any other citrus fruit juices help to stop the liver from making cholesterol stones. It contains pectin that helps to give relief from the gallbladder pain. Vitamin C in the juice makes the cholesterol more water soluble and promotes for the quicker elimination of waste. Stir freshly squeezed lemon, garlic paste and olive oil in a small bowl. Consume this mixture in the early morning on an empty stomach. Continue for 40 – 45 days to clear the gallstones from the body. Squeeze about 4 tablespoons of lemon juice. Add this juice to water and stir well. Drink this lemon juice 2 – 3 times a day for a few weeks. Peppermint oil is very helpful in digestion and it also stimulates the bile flow and other digestive juices. It contains terpene which is a natural compound that helps to dissolve the gallstones. For this, you can use peppermint tea or peppermint oil capsules that are enteric coated capsules. Boil water in a pan for a few minutes and then add mint leaves. Turn off the heat and cover to steep for 3 – 5 minutes. Strain and add honey as per your taste. Drink this tea in between your meals for effective results. Castor oil has many healing and medicinal properties. It helps to minimize and reduces the number of gallstones in the gallbladder. This oil contains an anti-inflammatory property that helps to neutralize the inflammation and reduces the pain. Pour pure, cold pressed castor oil in a pan. Warm it gently for few minutes. Soak the cheesecloth in this warm oil and wring out to remove the excess oil. Place this over the right side of the stomach where the gallbladder is located. Cover this cheesecloth with a plastic sheet for few minutes. Place a hot water bag on the plastic sheet for about 45 – 60 minutes to get rid of the pain. Repeat three times a week. Intake of high fiber food is very essential in curing the gallstones. For this, psyllium acts as a good remedy for gall stones. This has rich source of soluble fibers that helps to bind the cholesterol in the bile and thus prevents the formation of gallstones. Regular taking of this ingredient will also prevent constipation, another cause for gallstone formations. Add psyllium to water in a bowl. Drink this immediately after thorough stirring. For best results, drink this at night time before going to bed every night. Make sure to drink plenty of water after taking as it absorbs water more and makes you feel dehydrated. University of East Anglia researchers have found that wine is effective in preventing gallstones. Drink half a glass of wine whenever you suffer from gallstones pain and you will get relief from the pain within 20 minutes. Also drinking half a glass of wine daily will help to reduce the gallstone attacks by nearly 40%. Make sure to consult your doctor. Follow this process for about a week. For the first 5 days, drink a quart of apple juice everyday along with your regular diet. On the 6th day, make sure not to eat anything after 6 pm. At 6 pm, drink a glass of water mixed with a tablespoon of Epsom salt, repeat at 8pm. At 10 pm, take 4 oz of lemon juice mixed with equal quantity of olive oil and drink. In the morning you will definitely pass the gallstones, the salt acting as a laxative. Red bell pepper has lot of vitamin C, which is essential to prevent gallstones. Red bell pepper has 95 mg of vitamin C, so it’s always best to eat a single red bell pepper. Drink 8 – 10 glasses of water a day to detoxify the body from the harmful toxins and other impurities. It will also helps to keep the bile in the gallbladder and assists in breaking down the fat in the body. Eating small quantity of food in your meals will help for better digestion, so have 5 – 6 small meals rather than 3 big meals. Coffee increases the bile flow and prevents gallbladder stones. So drink 1 – 2 cups of coffee daily but not more. Have vitamin C rich foods like citrus fruits, tomato, lemon, etc. in the diet. Regular usage of spices and herbs like turmeric, black pepper, asafoetida, dried ginger, long pepper, etc. helps to stimulate the liver and gallbladder. Cut down the fried and fatty food. Always eat a low fat, less cholesterol and high fiber food as a part of your regular diet. Include omega – 3 fatty acids rich food like salmon, flaxseeds, walnuts, tofu, soybeans, cauliflower, Brussels sprouts, etc. in your diet to prevent the gallstones. Include more of vegetables in your diet. Eat lots of lentils, beans, oranges, nuts, peas and lima beans as a part of your daily diet to get more resistant to the attacks of gallbladder. Consume honey poured in a teaspoon of turmeric and have this everyday. Intake of rosemary essential herb will help to enhance the bile production and stops spasms that occur inside the bile duct. Avoid taking the refined foods such as poultry products, white flour, ice creams, eggs, red meat, artificial sweeteners, etc. Include turmeric in the diet. Always choose the foods which are boiled, baked, steamed, broiled or grilled. Calcium rich food has to be included in the diet. This calcium binds the acids that are present in the bile and reduces the existing one and prevents the formation of the new stones. Take artichoke leaves or its extract which effectively prevents the gallstones development in your gallbladder. Try to reduce weight if you are overweight. Place heat pack on the stomach for temporary relief from the pain. Drinking herbal teas work well, like St. John’s Wort tea. For making this tea, you have to boil a cup of water with 4 – 5 leaves in that water. Apply some natural oils on the area, like olive oil, coconut oil, almond oil, etc. Make sure to consult your doctor before using these remedies. Do you know any other effective remedy for removing the gallstones? Then share your experience with us.